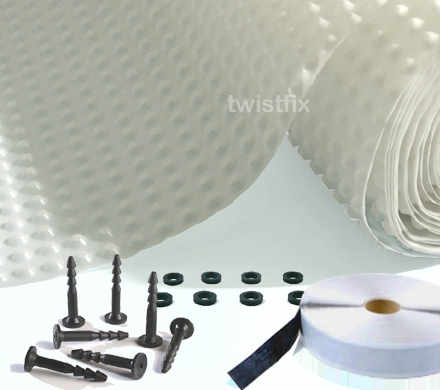 Recently Twistfix were approached by a customer who had an existing basement within his home. This had been previously waterproofed but a long time ago and he had heard about the waterproofing membrane which we currently stock. He had already had a professional basement contractor come and take a look at his basement and he suggested that the waterproofing membrane should be applied to the walls. After much research our customer found Twistfix and after showing us his plans we decided that the Waterproofing membrane kit would be ideal for him. The waterproofing membrane kit contained everything he needed to waterproof his basement. With two variations available you could effectively waterproof an area measuring either 40m2 or 48m2 of floor or wall. His basement conversion project was a huge success; he managed to turn his dark and damp basement into a lounge area with a huge screen which was perfect for gathering the family together and watching a film. The basement tanking has meant that there is now also space for the family tournament of Wii! Now the battle is on! With plenty of space to move around in the family are pleased with the results achieved. For more information on basement waterproofing and tanking membrane please call us on 0845 1236007 or email sales@twistfix.co.uk.